Binding selectivity refers to the differing affinities with which different ligands bind to a substrate forming a complex. A selectivity coefficient is the equilibrium constant for the reaction of displacement by one ligand of another ligand in a complex with the substrate. Binding selectivity is of major importance in biochemistry and in chemical separation processes. Selectivity is determined by various factors. In the case of iron overload, which may occur in individuals with β-thalessemia who have received blood transfusions, the target metal ion is in the +3 oxidation state and so forms stronger complexes than the divalent ions. It also forms stronger complexes with oxygen-donor ligands than with nitrogen-donor ligands. 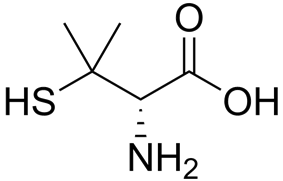 deferoxamine, a naturally occurring siderophore produced by the actinobacter Streptomyces pilosus and was used initially as a chelation therapy agent. Synthetic siderophores such as deferiprone and deferasirox have been developed, using the known structure of deferoxamine as a starting point. Chelation occurs with the two oxygen atoms. ^ Selectivity coefficient in ion exchange chromatography,"http://goldbook.iupac.org/goldbook/S05566.html". Retrieved 10 March 2010. ^ Rice, N.M.; Irving, H. M. N. H.; Leonard, M.A (1993). "Nomenclature for liquid-liquid distribution (solvent extraction)". Pure Appl. Chem. (IUPAC) 65 (11): 2373–2396. ^ Rydberg, J.; Musikas, C;Choppin, G.R. (Editors) (2004). Solvent Extraction Principles and Practice ( (2nd. ed.). Boca Raton, Fla.: CRC Press. ^ Buck, R. P.; Linder, E. (1994). "Recommendations for nomenclature of ion-selective electrodes". Pure App. Chem. (IUPAC) 66 (12): 2527–2536. ^ Cattrall, R.W. (1997). Chemical sensors. Oxford University Press. 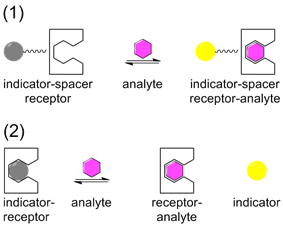 Chemical sensors are being developed for specific target molecules and ions in which the target (guest) form a complex with a sensor (host). The sensor is designed to be an excellent match in terms of the size and shape of the target in order to provide for the maximum binding selectivity. An indicator is associated with the sensor which undergoes a change when the target forms a complex with the sensor . The indicator change is usually a colour change (gray to yellow in the illustration) seen in absorbance or, with greater sensitivity, luminescence. The indicator may be attached to the sensor via a spacer, in the ISR arrangement, or it may be displaced from the sensor, IDA arrangement. ^ Klotz, I.M. (1997). Ligand-Receptor Energetics: A Guide for the Perplexed. Wiley. ^ Foreman, J.C.; Johansen, T. (Editors) (2003). Textbook of receptor pharmacology (2nd. ed.). Boca Raton, Fla.: CRC Press. ^ Walker, M.; Shah, H.H. (1997). Everything you should know about chelation therapy (4th ed.). New Canaan, Conn.: Keats Pub. ^ Iron-Selective Chelators With Therapeutic Potential in Hider, Robert C.; Kong, Xiaole (2013). "Chapter 8. Iron: Effect of Overload and Deficiency". In Astrid Sigel, Helmut Sigel and Roland K. O. Sigel. Interrelations between Essential Metal Ions and Human Diseases. Metal Ions in Life Sciences 13. Springer. pp. 229–294. ^ Miller, Marvin J. (1989). "Syntheses and therapeutic potential of hydroxamic acid-based siderophores and analogs". Chemical Reviews 89 (7): 1563–1579. ^ Ahrland, S.; Chatt, J.; Davies, N.R. (1958). "The relative affinities of ligand atoms for acceptor molecules and ions". Quart. Rev. 12 (3): 265–276. Treatment of poisoning by heavy metals such as lead and mercury is more problematical, because the ligands used do not have high specificity relative to calcium. For example, EDTA may be administered as a calcium salt to reduce the removal of calcium from bone together with the heavy metal.